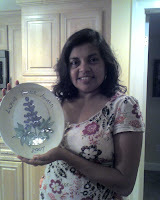 My Lupine Honor Book Award for Rickshaw Girl (Charlesbridge) arrived yesterday. It's a handmade stoneware platter crafted by Portland, Maine potter Toby Rosenberg. Thank you, Libraries of Maine!